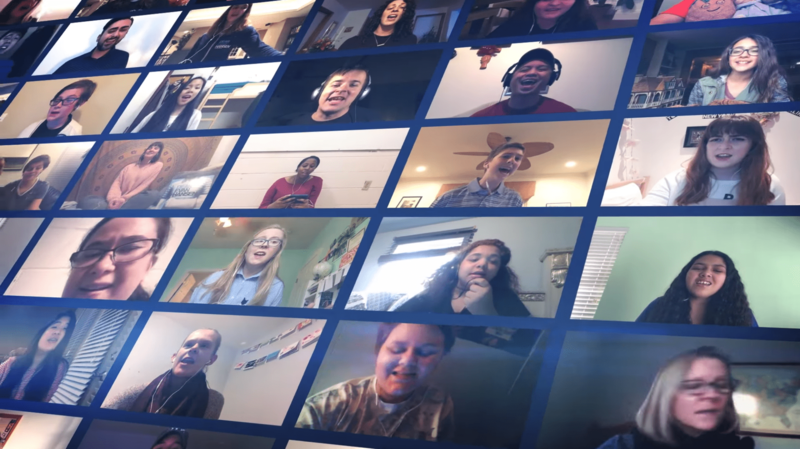 In honor of its one-year anniversary on Broadway, we created Broadway’s first-ever Virtual Choir for Tony Award®-winning musical, DEAR EVAN HANSEN. DEAR EVAN HANSEN wanted to celebrate its first year on Broadway with its legion of fans. These fans, from the beginning, had a powerful, emotional bond with the show. The centerpiece of the first-year celebration was a “Fan Day”— a free performance for the show’s community commemorating the show’s anniversary on Broadway. But we needed a way for millions of fans across the globe to be a part of the moment, not just the lucky few that would be in the theater. First and foremost, this activation was for and about DEAR EVAN HANSEN fans. Whether they’ve seen the show or connected with the music, this diverse group of people deeply connected to the show and its core belief that we all need to feel part of a community. The activation would also need to serve as an invitation to newcomers around the world to feel the power of the show in order to connect us all. The solution was to create Broadway’s first-ever Virtual Choir. We created a completely user-generated video with fan-sung lyrics, both as solos and in harmony, that celebrated the people who have “found” our show and each other. To make this happen, we launched a campaign landing page that provided users with submission guidelines, sheet music, and the instrumental track of the song. The call-to-submit was promoted via paid and organic social efforts, as well as a newsletter to our 200,000+ subscribers. From there, the video editing and graphics teams created a unique world that brought the mosaic featured in the show’s key art to life. The editing team also worked with the show’s music supervisor/orchestrator, Tony Award® and GRAMMY Award winner Alex Lacamoire, to unite over one thousand voices from the user submissions into a single track for the community-driven visuals. Finally, the video made its debut as the grand finale of a 40-minute long Facebook live pre-show that streamed online and in the theater before the Fan Day performance on December 10, 2017. The Virtual Choir was released as a standalone video the following day on Facebook, Twitter, Instagram, and YouTube.